Alvi SA, featured in the picture above, is an argentinian producer of tile, available through the following distributors. When designing a bathroom tile floor in a modern environment, the new LED lighting from Steuler can definitely make an impression that will fit perfectly in your design and wow everyone. 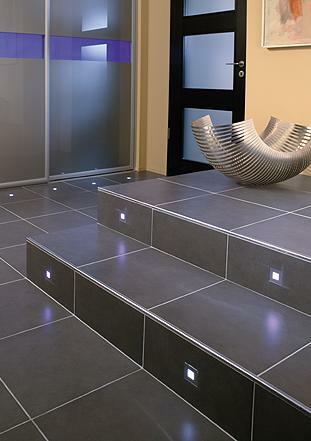 These new illuminated tiles can create a great ambiance and also have a practical use, as orientation lighting in floors. LED lighting can also be used to illuminate a backsplace as featured in the picture below. 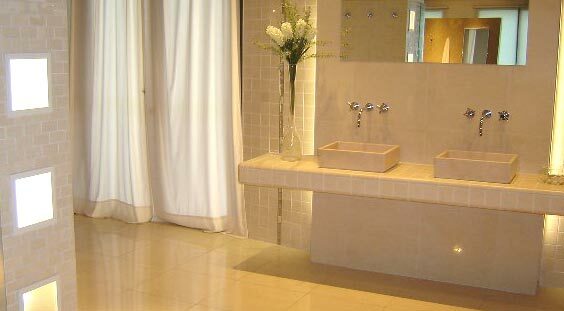 Look at the picture below to see how beautiful floor or wall tile can be used together with lighting to create a very special ambiance. Homeowners spend a lot of time selecting their preferred tile but often do not think enough how the room's lighting will affect the color and the whole room ambiance.